1. The corticospinal tract (medullary pyramid). Lesions result in contralateral spastic hemiparesis. 2. The medial lemniscus. Lesions result in contralateral loss of tactile and vibration sensation from the trunk and extremities. 3. The hypoglossal nucleus or intraaxial root fibers [cranial nerve (CN) XII]. Lesions result in ipsilateral flaccid hemiparalysis of the tongue. When protruded, the tongue points to the side of the lesion (i.e., the weak side). See Figure 1 3-7. Figure 14-1. Vascular lesions of the caudal pons at the level of the hypoglossal nucleus of cranial nerve (CN) XII and the dorsal motor nucleus of CN X. (A) Medial medullary syndrome (arterial spinal artery). (J3) Lateral medullary [posterior inferior cerebellar artery (PICA)) syndrome. 1. 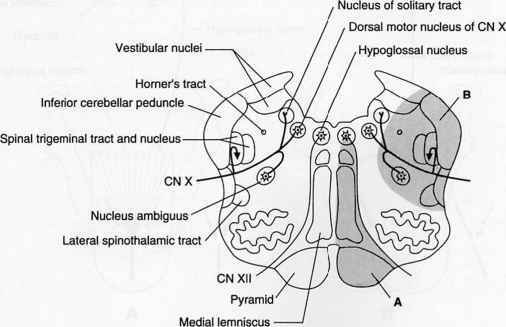 The vestibular nuclei. Lesions result in nystagmus, nausea, vomiting, and vertigo. 2. The inferior cerebellar peduncle. Lesions result in ipsilateral cerebellar signs [e.g., dystaxia, dysmetria (past pointing), dysdiadochokinesia]. 3. The nucleus ambiguus of CN IX, CN X, and CN XI. Lesions result in ipsilateral laryngeal, pharyngeal, and palatal hemiparalysis [i.e., loss of the gag reflex (efferent limb), dysarthria, dysphagia, and dysphonia (hoarseness)]. 4. The glossopharyngeal nerve roots. Lesions result in loss of the gag reflex (afferent limb). 5. The vagal nerve roots. Lesions result in the same deficits as seen in lesions involving the nucleus ambiguus (see 1 B 3). 6. The spinothalamic tracts (spinal lemniscus). Lesions result in contralateral loss of pain and temperature sensation from the trunk and extremities. 7. The spinal trigeminal nucleus and tract. Lesions result in ipsilateral loss of pain and temperature sensation from the face (facial hemianesthesia). 8. The descending sympathetic tract. Lesions result in ipsilateral Horner's syndrome (i.e., ptosis, miosis, hemianhidrosis, and apparent enophthalmos). 1. The corticospinal tract. Lesions result in contralateral spastic hemiparesis. 2. The medial lemniscus. Lesions result in contralateral loss of tactile sensation from the trunk and extremities. Figure 14-2. Vascular lesions of the caudal pons at the level of the abducent nucleus of cranial nerve (CN) VI and the facial nucleus of CN VII. (A) Medial inferior pontine syndrome. (B) Lateral inferior pontine syndrome (anterior inferior cerebellar artery (AICA) syndrome]. (C) Medial longitudinal fasciculus (MLF) syndrome. 3. The abducent nerve roots. Lesions result in ipsilateral lateral rectus paralysis. 2. The cochlear nuclei and intraaxial nerve fibers. Lesions result in unilateral central deafness. 3. The vestibular nuclei and intraaxial nerve fibers. Lesions result in nystagmus, nausea, vomiting, and vertigo. 4. The spinal trigeminal nucleus and tract. Lesions result in ipsilateral loss of pain and temperature sensation from the face (facial hemianesthesia). 5. The middle and inferior cerebellar peduncles. Lesions result in ipsilateral limb and gait dystaxia. 7. The descending sympathetic tract. Lesions result in ipsilateral Horner's syndrome. [see Figure 14-20] interrupts fibers from the contralateral abducent nucleus that project, through the MLF, to the ipsilateral medial rectus subnucleus of CN III. It causes medial rectus palsy on attempted lateral conjugate gaze and nystagmus in the abducting eye. Convergence remains intact. This syndrome is often seen in patients with multiple sclerosis. D. Facial colliculus syndrome usually results from a pontine glioma or a vascular accident. The internal genu of CN VI1 and the nucleus of CN VI underlie the facial colliculus. 1. The superior colliculus and pretectal area. Lesions cause paralysis of upward and downward gaze, pupillary disturbances, and absence of convergence. 2. The cerebral aqueduct. Compression causes noncommunicating hydrocephalus. Figure 14-3. Lesions of the rostral midbrain at the level of the superior colliculus and oculomotor nucleus of cranial nerve (CN) III. (A) Dorsal midbrain (Parinaud's) syndrome. (B) Paramedian midbrain (Bcncdikt) syndrome. (C) Medial midbrain (Weber) syndrome. 1. The oculomotor nerve roots (intraaxial fibers). Lesions cause complete ipsilateral oculomotor paralysis. 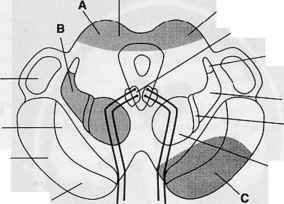 Eye abduction and depression is caused by the intact lateral rectus (CN VI) and superior oblique (CN IV) muscles. Ptosis (paralysis of the levator palpebra muscle) and fixation and dilation of the ipsilateral pupil (complete internal ophthalmoplegia) also occur. 2. The dentatothalamic fibers. Lesions cause contralateral cerebellar dystaxia with intention tremor. 3. The medial lemniscus. Lesions result in contralateral loss of tactile sensation from the trunk and extremities. 1. The oculomotor nerve roots (intraaxial fibers). Lesions cause complete ipsilateral oculomotor paralysis. Eye abduction and depression is caused by intact lateral rectus (CN VI) and superior oblique (CN IV) muscles. Ptosis and fixation and dilation of the ipsilateral pupil also occur. 2. The corticospinal tracts. Lesions result in contralateral spastic hemiparesis. Figure 14-4. Magnetic resonance image of an acoustic neuroma. 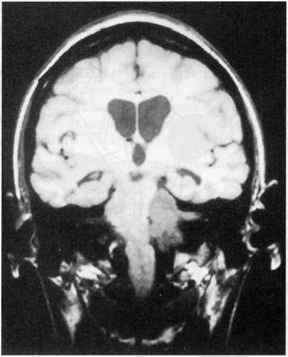 This coronal section shows dilation of the ventricles. The vestibulocochlear nerve is visible in the left internal auditory meatus. The tumor indents the lateral pons. Cranial nerve (CN) palsies include CN V, VII, and VIII. Symptoms include unilateral deafness, facial anesthesia and weakness, and an absent coronal reflex. This is a T1-weighted image. A. The cochlear nerve of CN VIII. Damage results in tinnitus and unilateral nerve deafness. B. The vestibular nerve of CN VIII. 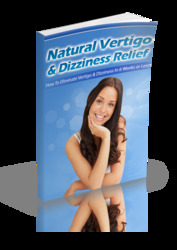 Damage results in vertigo, nystagmus, nausea, vomiting, and unsteadiness of gait. C. The facial nerve (CN VII). Damage results in facial weakness and loss of the corneal reflex (efferent limb). D. The spinal trigeminal tract (CN V). Damage results in paresthesia, anesthesia of the ipsilateral face, and loss of the corneal reflex (afferent limb). E. Neurofibromatosis type 2 often occurs with bilateral acoustic neuromas. Figure 14-5. Anatomy of tbe subclavian steal syndrome. Thrombosis of the proximal part of the subclavian artery (left) results in retrograde blood flow through the ipsilateral vertebral artery and into the left subclavian artery. Blood can be shunted from the right vertebral artery and down the left vertebral artery (A). Blood may also reach the left vertebral artery through the carotid circulation (J3). 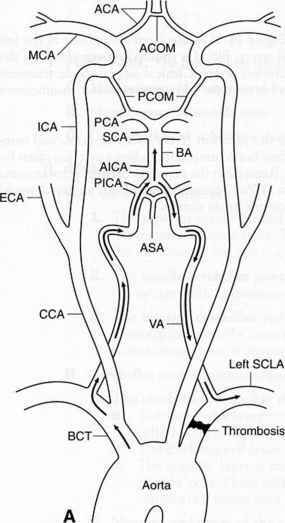 ACA = anterior cerebellar artery; ACOM = anterior communicating artery; AICA = anterior interior cerebellar artery; ASA = anterior spinal artery; J3A = basilar artery; BCT = brachiocephalic trunk; CCA = common carotid artery; ECA = external carotid artery; 1CA = internal carotid artery; MCA = middle cerebral artery; PCA = posterior cerebral artery; PCOM = posterior communicating artery; PICA = posterior inferior cerebellar artery; SCA = superior communicating artery; SCLA = subclavian artery; VA = vertebral artery. fected bilaterally. The oculomotor and trochlear nerves are not injured. Patients are conscious and may communicate through vertical eye movements. VII. CENTRAL PONTINE MYELINOLYSIS is a lesion of the base of the pons that affects the corticospinal and corticobulbar tracts. More than 75% of cases are associated with alcoholism or rapid correction of hyponatremia. Symptoms include spastic quadriparesis, pseudobulbar palsy, and mental changes. This condition may become the locked-in syndrome. VIII. "TOP OF THE BASILAR" SYNDROME results from embolic occlusion of the rostral basilar artery. Neurologic signs include optic ataxia and psychic paralysis of fixation of gaze (Balint's syndrome), ectopic pupils, somnolence, and cortical blindness, with or without visual anosognosia (Anton's syndrome). IX. 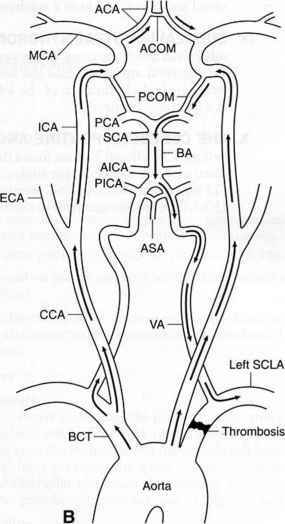 SUBCLAVIAN STEAL SYNDROME (Figure 14-5) results from thrombosis of the left subclavian artery proximal to the vertebral artery. Blood is shunted retrograde down the left vertebral artery and into the left subclavian artery. 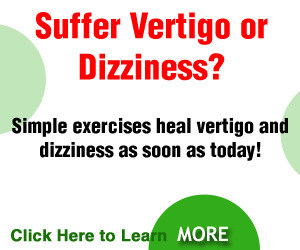 Clinical signs include transient weakness and claudication of the left arm on exercise and vertebrobasilar insufficiency (i.e., vertigo, dizziness). X. THE CEREBELLOPONTINE ANGLE is the junction of the medulla, pons, and cerebellum. CN VII and VIII are found there. Five brain tumors, including a cyst, are often located in the cerebellopontine angle cistern. Remember the acronym SAME: schwannoma (75%), arachnoid cyst (1%), meningioma (10%), ependymoma (1%), and epidermoid (5%). The percentages refer to cerebellopontine angle tumors. What cerebral artery affects the vestibulochoclear nerve?